Higher Education and Highways Minister Lakshman Kiriella yesterday assured that the South Asian Institute of Technology and Medicine (SAITM) would not be abolished as it had already been recognised by law through the Appeal Court decision which had been given recently. Addressing a press conference held at his Ministry auditorium in Battaramulla, Minister Kiriella said the government was ready to gazette the minimum standard for medical education once it was received from the Sri Lanka Medical Council (SLMC). The Minister, however, urged the SLMC to prepare minimum standards for medical education soon. He lashed out at the SLMC for demanding that minimum standards for medical education be gazetted without even preparing them. "It is the responsibility of SLMC and the Deans of the Universities to do so," Kiriella said. "Once we receive the minimum standards we are ready to gazette them," he added. Minister Kiriella noted that the SLMC had already appealed against the Court of Appeal decision to the Supreme Court and therefore everyone had to wait till the Supreme Court judgment was delivered. President Maithripala Sirisena had thrice invited SLMC to discuss the issue but its members had not come, saying they had already made an appeal to the Supreme Court, Minister Kiriella said, adding they had urged the students to protest and not to attend lectures. 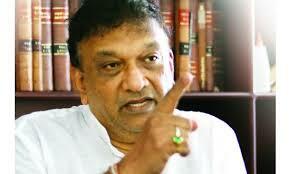 Minister Kiriella claimed the SLMC and other unions had no intention of solving the issue. There were some forces bent on defeating the government and they were trying to blow the SAITM issue out of proportion, he alleged. The Chairman of SAITM Dr. Neville Fernando had sent a letter to the University Grants Commission (UGC) informing it that he was prepared to hand over the Neville Fernando Hospital to the government in a Public Private Partnership (PPP) agreement and it had not yet been discussed as the SLMC and other unions had refused to participate in discussions, Minister Kiriella said. Meanwhile, Minister Kiriella stressed the Ministry together with UGC would bring Quality Assurance Bill to parliament in the near future to control and monitor the quality of university education in the country.